Sunday is our only day off from work so Don and I make sure we spend it with Julia. We attend Kindermusik with Teacher Jeannie in the morning, go to church, accomplish household errands, shop (only when necessary), go out for our road trip... yup, all in one day! So we need to plan our Sundays very well so it can be productive and at the same time, fun. For our shopping needs, we cannot simply "mall-hop" just to buy all the things on our list. If we do that, we might spend most of our time on the road. Whenever we go to the mall, I need to strategically plan (yes, I do have a list of things to do and buy inside the mall) our itinerary. It really is time consuming. This is the reason why I sometimes shop online or I go to bazaars organized for moms and kids. Mommy Mundo Bazaar is one of the few bazaars I look forward to because most of the things I need to buy for Julia are in one location! Actually, only a few steps apart! My shopping list for Julia next weekend include: cloth diapers, shoes, feeding bottles and sleepwear. Aside from shopping, I am excited to get my Mommy Mundo Privilege Passport and 24/7 Planner! Also, I will be joining a small group of moms who will meet Jen of Next9 for some babywearing tips (I use SaYa and I just recently purchased a Next9 ring sling from Jen). So see you on November 24-25! Say hi, okay? 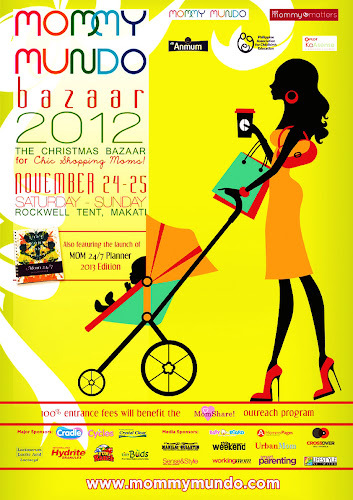 The Christmas Bazaar for Chic Shopping Mamas! November 2, 2012- Doctor's appointment, pickup daughter from ballet practice, get snacks for son's play date, meeting with the client at 3PM, lunch with in-laws on the weekend and date night with the hubby tonight... Sound's familiar? Moms nowadays are getting busier and busier and it's actually becoming a wonder how they do it. Juggling multiple roles and responsibilities: the kids, their husbands, a career or business, and hobbies on the side- surely they must have a sidekick even just to remind them of their next task or to breathe. 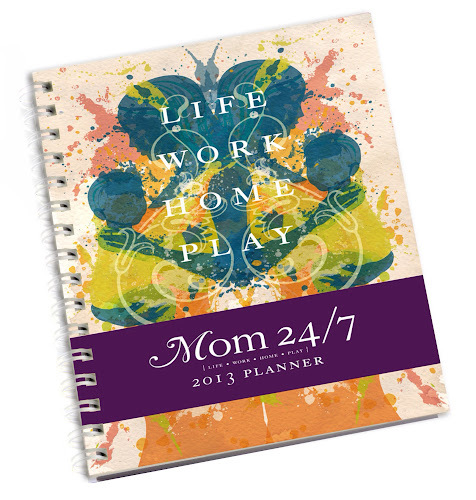 If you're a mom who strives to be efficient and organized, then the Mom 24/7 2013 Planner is especially made for you. Join the thousands of moms who have benefited from using the organizer since the launch of its maiden issue in 2012. Tagged as "The Ultimate Mom Planner," the 6x8 inch hard bound, spiral bound organizer is equipped with special planning pages to help you manage your personal, family, home and work life so you can have more time to spend at will. May it be for quality family time, productive work time or "me" time. The Mom 24/7 2013 Planner isn't called "The Ultimate Mom Planner" for nothing. The organizer has a special portion for mom's personal development where you can list down your goals and ideas. The planner even has a menstrual tracker. If you are also feeling joyous or reflective, be inspired along with the other moms who shared their personal experiences about motherhood which you can read on the topmost part of every page. The Mom 24/7 2013 Planner will be available at the following retailers by third week of November: Fully Booked, National Bookstore, Hobbes & Landes, Numa, Medela House, Momtrepreneur Shop, and online through www.shopmommymatters.com, and Indigo Baby. For more info visit www.MommyMundo.com/mom247planner2013, email info@mommymundo.com or text 09178162524.